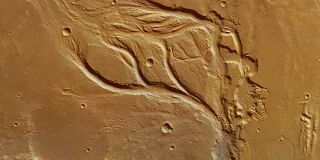 The central portion of Osuga Valles on Mars resembles features found in the arid deserts of Arizona, rather than those formed by emerging groundwater in Florida. The Martian surface is crisscrossed with what looks like the scars of running water cut into its dusty dry surface. For years, researchers have argued over the source of this water, whether it was fed by rainwater falling from the sky or from ice melting beneath the surface. By taking a statistical approach to the features, a trio of researchers now argue for rivers of rainwater. The team studied all the mapped river valleys on Mars, measuring the angles where they divided from one another. These angles are determined by how dry an area is and whether water has emerged from the ground, among other things. They found that the angles are comparatively low, allowing them to rule out the influence of groundwater as a major formation process for the channels. The emergence of groundwater and the dryness of a region both play a role in determining the angle between the branches of a river. According to lead author Hansjörg Seybold, this implies there must have been a similar hydrological environment with sporadic heavy rainfall on Mars over a prolonged period. The rainwater would have quickly run off over the surface, shaping the network of valleys. Seybold, a physicist at ETH Zurich, worked with terrestrial geologist James Kirchner, also at ETH Zurich. Edwin Kite, a planetary specialist at the University of Chicago, was the third team member. Their research was published June 27 in the journal Science Advances. Although Mars is dry today, scientists think it once held an ocean of water in much of its northern hemisphere nearly 4 billion years ago. The thicker atmosphere it used to have kept the liquid on the surface. As water evaporated, it would have condensed around the volcanoes in the highlands south of the ocean, then rained down, carving out the river valleys. The Colorado River from space on March 12, 2013. "Recent research shows that there must have been more water on Mars [in the past] than previously assumed," Seybold said in a statement. But the Red Planet's wet period was short-lived, lasting only a few hundreds of millions of years. The atmosphere was lost to space, and any liquid on the surface quickly disappeared, leaving scientists to ponder where the water went. "It's likely that most of it evaporated into space," Seybold said. "But it could still be in the vicinity of Mars." "This is a question for a future space mission," he said.